I’m reading (and greatly enjoying) “Women from the Ankle Down,” Rachelle Bergstein’s 2012 history of women’s shoes in the 20th Century. I actually intended to write a piece on Nancy Sinatra, who Bergstein covers in some detail, but I was struck by an observation she made regarding the role of artificial fabrics in promoting the spread of fashion boots in the sixties and thought it was worth sharing here. As I’ve already noted in a previous post, there were shortages of leather in the mid-sixties, which led to a rise in prices. 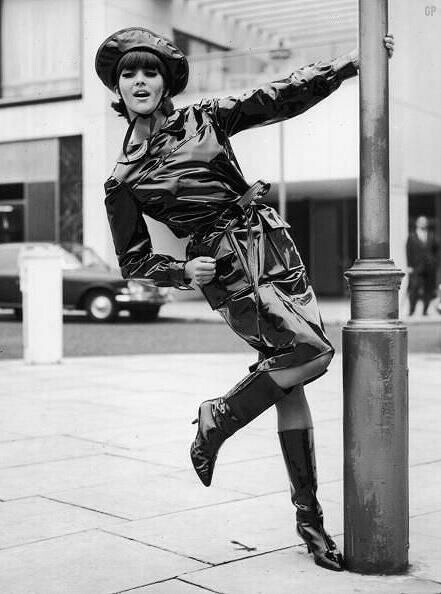 At the same time, designers like Mary Quant were experimenting with other materials, such as PVC and Corfam, the latter being a shiny artificial leather produced by DuPont. These materials were significantly cheaper than real leather, but also much less durable (you’ll notice if you visit vintage clothing stores that there are very few shoes and boots from this period still around today). Bergstein proposes that unlike their mothers, who had lived through rationing and postwar austerity, and regarded a good pair of shoes as an investment requiring many years of wear, the young women of the sixties were more open to the idea of disposable fashion; inexpensive, trendy items that could be quickly replaced as and when they went out of fashion. As Bergstein notes, a knee-length boot crafted out of leather would be significantly more expensive than one made from PVC or Corfam. That would place it beyond the reach of teenagers and young women, and only available to the sort of older, wealthy clientele less likely to take on radical new trends. But instead, the go-go boot became widely adopted by a new breed of young, fashion conscious, independent, and sexually and politically liberal women. So you could say that the cheap, plastic boot opened the way for the widespread acceptance and adoption of boots in the following decade. If you accept this idea – and it certainly seems convincing – then it forms an intriguing contrast with the fate of the so-called “Russian boot,” the fashion boot of the 1920s and 30s. The Russian boot failed to make a long-term impact because it was too cheap and too egalitarian. Wealthy women were reluctant to adopt the style because of the lack of durability of the materials used and the fact that the boots were affordable footwear for the masses. The same factors that made the go-go boot such a success doomed the Russian boot to failure, because fashion in the twenties was still the preserve of the old and the rich. Something to mull over. Thanks very much – brilliant, classy site / blog, verging on a work of genius ! I particularly love the images of the late 70s catalogues – gorgeous…They bring back many happy memories – believe me ! I suspect you feel the same way. My mother used to receive the Trafford Catalogue – my grandmother Empire Stores and Kays – at that time all unconnected, I think – so I used to look forward every autumn to 3 lots of lovely ladies in boots ! PS can we please have lots more ? I just had to thank you…. Some more brilliant images – thanks very much !!! !